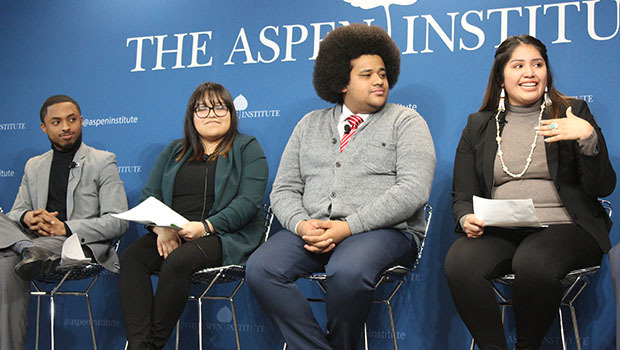 The Aspen Institute’s Center for Native American Youth (CNAY) will honor five Native American youth as “Champions for Change” in a series of events March 4-6, 2013. This program, inspired by a White House initiative, is designed to shine a spotlight on positive stories in Indian Country. 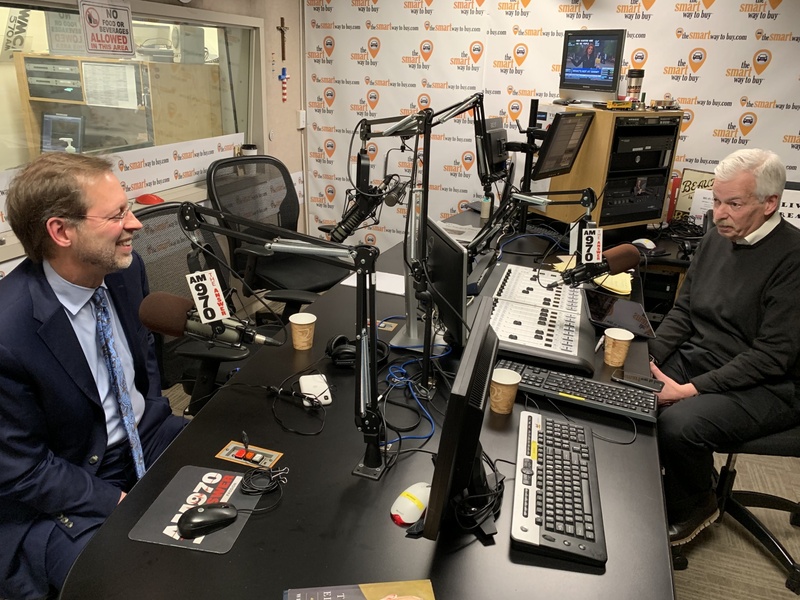 “Native American youth are the most at-risk population in this country,” said Jefferson Keel, President of the National Congress of American Indians and Lieutenant Governor of Chickasaw Nation. Young Native Americans face some of the most serious economic disparities, oftentimes living in communities with chronically underfunded health, education, and law enforcement systems and even more limited funding to urban communities. Cierra Fields, a 14 year old from Cherokee Nation of Oklahoma, and one 2013 Champion for Change, suffered a serious illness at a young age. Like many Native American youth, she faced an underfunded health care system that fellow Champion Joaquin Gallegos describes as “rationed care for many communities.” After battling melanoma, Cierra went on to create her own initiative to reach out to her tribal community, young people included, to raise awareness of cancer, diabetes, and promote new resources to address the need. In addition to health care needs, the poverty rate on Indian reservations is 36 percent. The unemployment rate in Indian Country is on average at nearly 22 percent, reaching over 80 percent in some areas of the country. 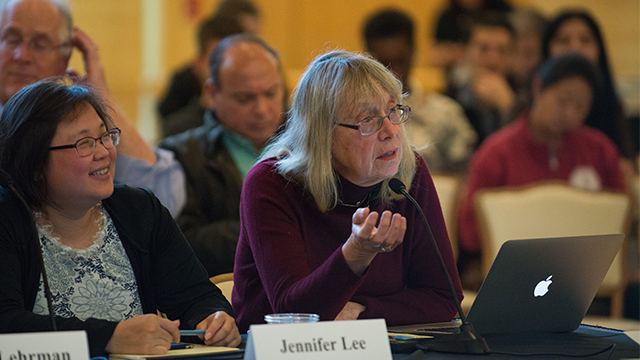 “My resolve is not to let [a barrier] obstruct my goals or quality of my efforts to progress American Indian and Alaska Native peoples,” said Gallegos. “I see myself and my peers not as the future of our tribe, but as the present,” remarked another Champion for Change, Sarah Schilling. 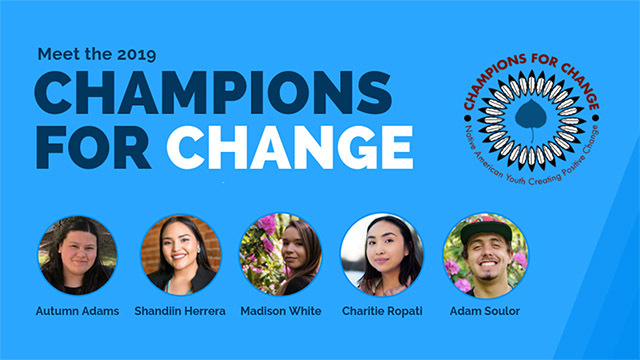 Together, the five Champions for Change will tell their stories of overcoming obstacles to become young leaders for Indian Country on the national stage. During their time in DC, the Champions will help celebrate CNAY’s second year anniversary, share their stories at a panel discussion in the Senate, tour the White House and Capitol as well as meet with White House staff, federal agency leaders, and many other distinguished individuals. Supporters of the Champions for Change program include the Alaska Native Tribal Health Consortium, the Aspen Institute, Choctaw Nation, Salt River Pima-Maricopa Indian Community, and most recently, an anonymous donor who gave $125,000 to support this project over the next few years. Nike also donated hundreds of dollars of N7 (Nike’s Native brand) products for the youth and their chaperones. 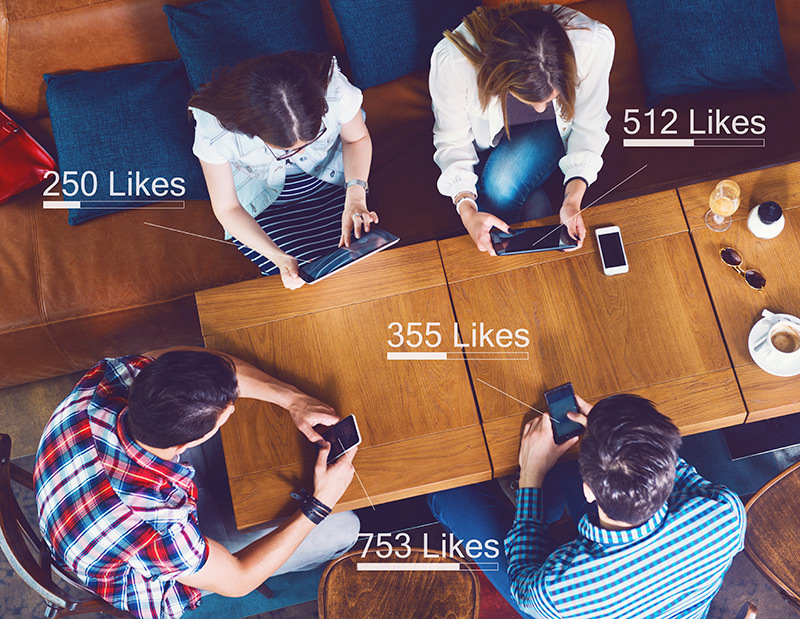 Watch CNAY’s video introduction to Champions for Change.